YCS Pasadena: ATTACK OF THE GIANT CARDS!! There are two new GIANT cards from Hidden Summoners here in Pasadena, California! Two Duelists will have the opportunity to take home GIANT copies of these cards by winning the ATTACK OF THE GIANT CARDS!! Public Event, while other Duelists will have the opportunity to take home smaller (but still pretty big) versions of them. Check out which GIANT cards are available here in Pasadena! 200th YCS Columbus: Saturday’s ATTACK OF THE GIANT CARD!! Winners! Congratulations to the winners of the Saturday ATTACK OF THE GIANT CARD!! tournament! Here are Sunday’s ATTACK OF THE GIANT CARD!! winners! Congratulations to Saturday’s Attack of the Giant Cards!! Winners! 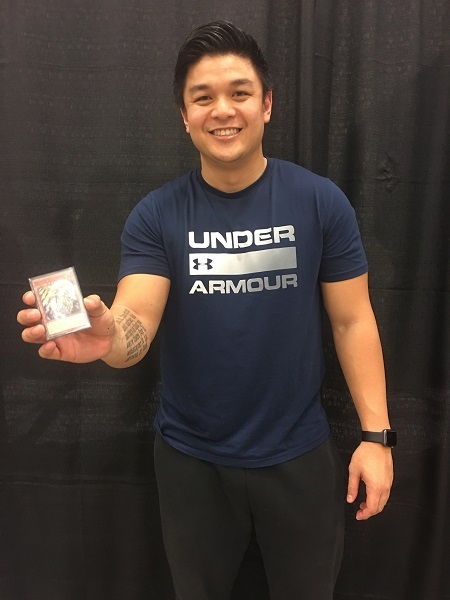 UDS Invitational – Summer 2018 ATTACK OF THE GIANT CARDS!! Two new GIANT cards are on display at the UDS Invitational – Summer 2018! Mischief of the Time Goddess and Aleister the Invoker of Madness from Shadows in Valhalla are up for grabs in this weekend’s ATTACK OF THE GIANT CARDS!! Tournaments! North America WCQ: Sunday’s ATTACK OF THE GIANT CARDS!! Tournament! Check out the winners of Sunday’s ATTACK OF THE GIANT CARDS!! Tournament at the 2018 North America WCQ!